In this paper entitled Urban Governance and Spatial Transformation Ambitions in Johannesburg, for the Journal of Urban Affairs, Vol 41 – 2019, Issue 1: New Urban Governance, Edgar Pieterse explores the history of democratic decentralization reforms in South Africa and Johannesburg with an eye on analyzing the significance of the Corridors of Freedom flagship initiative of the Johannesburg metropolitan government. Urban governance has been thrust into the spotlight in the wake of the Sustainable Development Goals adopted by the United Nations in September 2015. A number of the 17 goals assume strong urban governments with the requisite powers and financial capacities to restructure the functioning of regional economies so as to establish transition pathways toward more sustainable societies. South Africa, and Johannesburg’s metropolitan government in particular, represents an instructive case study of precisely this kind of local government. South Africa adopted one of the most far-reaching systems of decentralization with the advent of democracy in the mid-1990s and enshrined local government autonomy within the constitution of 1996 along with the provision for integrated metropolitan governments. Significantly, these authorities have the powers and fiscal resources to confront conflictual and irresolvable differences in the city, which are inevitable outcomes from decades of oppressive racial government. 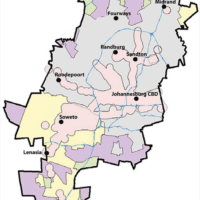 The article explores the history of democratic decentralization reforms in South Africa and Johannesburg with an eye on analyzing the significance of the Corridors of Freedom flagship initiative of the Johannesburg metropolitan government. This exercise affords a critical perspective on the latest generation of strategic planning and prioritization in metropolitan South Africa. Edgar Pieterse is the director of the African Centre for Cities and the South African Research Chair in Urban Policy .